Wong, H. (2011). Enhancing Learner autonomy in an on-line editing programme. Studies in Self-Access Learning Journal, 2(3), 153-169. Little (1999) argues that in formal educational contexts, “the basis of learner autonomy is acceptance of responsibility for one’s own learning” (p.11). An autonomous learner takes responsibility for various aspects of learning (Benson & Voller, 1997; Holec, 1981). This study examines how learner autonomy opportunities were provided at various stages of writing in an on-line editing programme for a group of electronic engineering students and how the students took charge of their language learning when receiving feedback on their technical writing. The impact on their own learning effectiveness of the decisions students made is also discussed. In recent years, attention has been drawn to the fact that many undergraduates are not communicating as well in their academic majors as they are expected to (Bruffee, 2008; Shapiro, 1991). In Hong Kong, where considerable resources are devoted to tertiary level language foundation programmes, this trend may suggest that the general English language input students receive may not be able to meet their discipline-specific needs in communicating in the technical discourse communities in which they aspire to be members of. While some writing teachers believe that there are features of academic prose which are common across disciplines and that learning the common core of academic writing should be enough to enable students to communicate technical content, others argue that there are great differences in writing practices in different disciplines and students who are familiar with “classroom genres” may find it difficult to move into an academic or professional discourse community (Johns, 1995). For second language learners at tertiary level, therefore, academic writing in their subject major discipline can be a very frustrating experience (Harvey & Chickie-Wolfe, 2007). It is thus important for students to master the conventions of the specific fields they are studying. The emergence of writing-across-the-curriculum (WAC) programmes in the US in the 1970s (Thaiss, 1998) was one response to concerns such as these. WAC programmes were built on the belief that second language learners can learn English more effectively through content (Mohan, 1986). In the City University of Hong Kong (CityUHK), Electronic Engineering (EE) students are asked to write project proposals, lab reports, progress reports, and final reports, which many of them have not been trained to write. The traditional language training that students have received in their secondary schools has not prepared them to meet the challenges of technical discourse production. EE faculty members are concerned that their students acquire the ability to effectively express the many good EE-specific ideas that they have to the EE technical community. In CityUHK, all EE students are required to attend at least one credit-bearing language course which can range from 24 to 39 contact hours and is designed to help students write up general technical reports. However faculty members have been concerned as to how to ensure that language input is timely enough to help students build up the language competence they need to function in their technical profession, and how, in the long term, to help them take charge of their own learning. To respond to the concerns of the EE faculty, a writing-across-the-curriculum (WAC) programme, the Language Companion Course (LCC), was integrated into the syllabus of one of the EE academic subjects. The aim was to empower students to learn to write and write to learn (Thaiss, 1998). The programme has two objectives: (i) to help students to improve their English writing ability within their own subject discipline, and (ii) to help students to develop autonomy in learning the conventions of written English. The LCC provides an online platform for students to collect feedback on their written work from language specialists. Autonomy opportunities are embedded at different stages of the writing process. Participation in the programme is voluntary for subject teachers, thus attracting only those teachers who are enthusiastic and dedicated to helping students to improve their English writing abilities in the discipline. Since its inception in 2007, the LCC has provided online editing advice to 15 academic programmes. In some programmes, a language mark, weighted at a maximum of 10% of the total marks of the essay, was given to encourage students to take part in the project. In others, no language mark was given. Student participation is completely voluntary and they can join in or drop out at any stage of the project. At the beginning of the programme, subject teachers who agree to take part in the project, work with a language specialist to discuss the language requirements of the written assignments and the input that should be provided for the students. Then a one-hour writing workshop which highlights the rhetorical focuses and discourse moves of the assignments is advertised on the course Blackboard site to prepare students for writing the course assignment. The workshop is conducted in the normal class time, but the materials are posted on-line to give students an alternative learning option. Students can refer to their learning needs and then decide the learning methods they will adopt to address them. Workshop attendance is not counted as class contact time; it is again optional for students to come to the workshop or to study the handouts at home. The participation of individual academic faculties and programmes varies. The LCC has helped students in some academic programmes with one written assignment while other programmes have invited LCC input for two. When students need to send in two essays for language advice, two workshops will be given. In addition to explaining the rhetorical requirements of each essay type, some common problems observed in the students’ writing of the first essay will be mentioned in the second workshop to help students to avoid making the same mistakes again in the second essay. A group of high-calibre teachers were recruited to work part-time to provide feedback on a maximum of two drafts that students were entitled to send in. All of these on-line tutors had at least 5 years of experience in teaching English in tertiary institutions and most of them were actually part-time tutors for language courses in the same university where the students were studying. Besides willingness to become an autonomous learner, students should possess both the knowledge and skills to act independently (Littlewood, 1997). A folder containing guidelines for both students and tutors is posted on-line to explain the project objectives and its design and to advise participants on the computer skills they need for the programme. Table 1 outlines the opportunities provided to students to take charge of their learning before taking part in the online writing programme. Students taking part in the LCC are entitled to submit a total of two drafts for language advice before they send in a final version to the language tutors for a language mark and the same version to their subject teacher for a content mark. When students are writing the first draft, they can make reference to on-line resources, such as an on-line dictionary and collocation check, recommended to them and hyper-linked to their course Blackboard site. When they are writing the second and subsequent drafts, they can refer to the language advice given on their previous drafts. This will be explained in the next section in more detail. 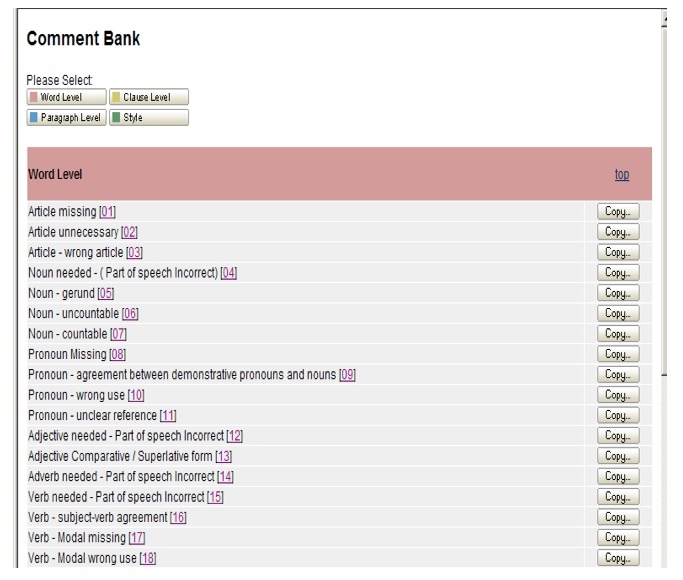 A variety of feedback, including computer–generated comments, marginal notes, overall comments and a checklist of the accomplishments in terms of Intended Learning Outcomes (ILO) (Biggs & Tang, 2007) is given on all the drafts submitted. More opportunities are given to students to take charge of their learning when language use is the focus. When a language error is identified, a comment from the 78-item Comment Bank is pasted at the point in the text where the problem occurs. The idea of the Comment Bank originated from David Wible of Tankang University, Taiwan, and was further developed into a list of comments at four levels: WORD, CLAUSE, PARAGRAPH and STYLE by a group of CityUHK language teachers. Figure 1. The interface of the Comment Bank on the blog. A number code is pasted next to the language error identified and students can legitimately respond to these spotted errors in different ways. Students who are confident of their own ability to correct their problems edit the error immediately and move on to read the next feedback. Others who need more help can click on the number code to find more information about the problem. As the language problems were highlighted but not corrected, students should feel obliged to find out the correct answers for themselves. Figure 2. Examples of highlighted and number-coded language problems on students’ drafts. Once the number code has been clicked on, an explanation page pops up. This page states what the language problem is, explains what should be done and gives examples of the correct and incorrect uses of the language point in a discipline-specific context to illustrate its appropriate use. Figure 3. The explanation notes of the comment. When students believe they have learned enough about their language problem, they can go back to their text and edit their work. However if students want to study more about the language problem, they can click on the links to external grammar learning websites for more explanations, exercises, and even tests. Thus in the revising processes, students can always choose the materials and activities to help develop their English ability with reference to their interests, learning needs, and the amount of input they want to put into improving their language use. It is not uncommon for students to make mistakes when revising. Hence it is advisable for students to send in more than one draft to improve their written work before it is finalized (Ferris, 1998). Working on the revised drafts can give students opportunities to take responsibility for their own learning, as they have to explore the identified problems in greater depth making use of the online resources. Table 2 shows the learner autonomy opportunities provided at this stage. 1) How do students respond to the opportunities open to them at various stages of writing to take charge of their language learning? 2) To what extent are these opportunities useful in enhancing students’ writing abilities? To examine students’ responses to the opportunities provided for learning autonomy, participation rates were reported. This rate includes the number of times students (i) submitted their written work to seek language advice, and (ii) viewed the external grammar links. To investigate how students benefited from these learning opportunities, the numbers of errors identified in the students’ written work were compared and examined. The data were collected by an independent institute, the CityUHK Education Development Office, over four semesters. The number of participants over each piloting semester is listed in Table 3. In the early days of the project, due to funding and personnel limitations, some data were not collected from both groups of subjects and different aspects of data from the same group of students were not collected at the same time. When students are viewing the page of explanatory notes and the feedback from the Comment Bank, they can visit the grammar links for further information. In semester 1, Grammar links were linked to the five most common errors the BCH students had made in a previous pilot study. These problems were, in the order of highest frequency of error, the uses of countable and uncountable nouns, articles, prepositions, spelling and collocation. Table 4 shows the viewing rate of these language problems. For instance, 22 students had received advice on collocation problems and all of them had logged on to the recommended grammar links for more information. However, only about half of the students who had been advised on their use of plurals had checked on the grammar links. Students who visited the grammar links demonstrated high levels of learner autonomy when they showed awareness of their own weaknesses, decided to study the problem further, and chose certain materials to work on. Likewise, less effort was put into dealing with problems that could be fixed in a relatively straightforward manner, such as spelling. In semesters 3 and 4, the Electronic Engineering students were asked to write two reports, namely a Progress Report and a Final Report, for a product they had designed in each semester. Students were first asked to write a Progress Report to describe the problems encountered and changes made during the production process, and, at the end of the semester, a Final Report to discuss the underlying theories, the algorithms, the approach, and the significance of the production. Two products, namely a rechargeable USB and a test jig, were designed and four reports were sent in. Students were asked to write about 1,000 words for the Progress report and 1,200 words for the Final Report. As shown in Table 5, the class size went down in semester 4 as some students had joined an internship programme. However, the majority of students stayed. First it was found that the participation rate, which shows the number of students who submitted their drafts for advice at least once, for writing Progress Reports, is greater than that for Final Reports in two piloting semesters. For instance, seventy-four (i.e., 25 + 49) students sent in their first Progress Reports at least once while only thirty-eight (i.e., 12 + 26) sent in their Final Reports. Sixty-one (i.e., 34 + 27) students sent in their Progress Reports at least once in semester 4 while thirty (i.e., 22 + 8 ) sent in their second Final Reports. Students were asked to write the Progress Reports before the Final Reports and the time lag between these reports was about three weeks. It is likely that after receiving a lot of help from the tutor’s feedback or from the recommended external grammar links in the first assignment—the Progress Report, students may have become more aware in self-checking and more knowledgeable about language learning resources. Thus they might have been less dependent on the on-line feedback on their drafts as they were for the Progress Reports. They sent in fewer drafts and some might even have sent in their final draft straightaway. Second, the participation, which reduced for the first Final Report, went up again for the second Progress Report. This varied participation illustrated that students did not work equally hard for the different drafts. It is likely that students recognising the usefulness of the online language advice in helping them to write re-joined the programme to refresh what they had learned in writing reports in the previous semester. This once again illustrates that students regulate the effort they put into language learning according to the evaluation and decisions made about their learning needs at different stages of their writing process. The impact of providing the self- access opportunities for students on their writing of technical reports was illustrated quantitatively. As the complete draft of each report sent to the language tutors was marked with the help of the Comment Bank, and each comment was given a code, an error rate, that is the number of language errors identified per 100 words, was established to show the number of language problems identified in the full script. 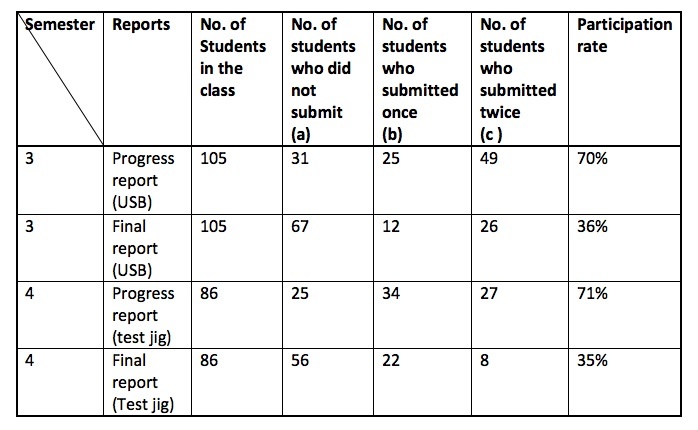 As shown in Table 6, there were 25, 12, 34, and 22 students who had submitted one draft only for the 4 reports in the two semesters, and the numbers of students who had submitted twice in these four reports were 49, 26, 27, and 8 respectively. Students who submitted twice demonstrated their autonomy in learning by being aware of their needs, finding resources to enhance their learning effectiveness, and taking appropriate measures to deal with their writing problems (Benson & Voller, 1997). 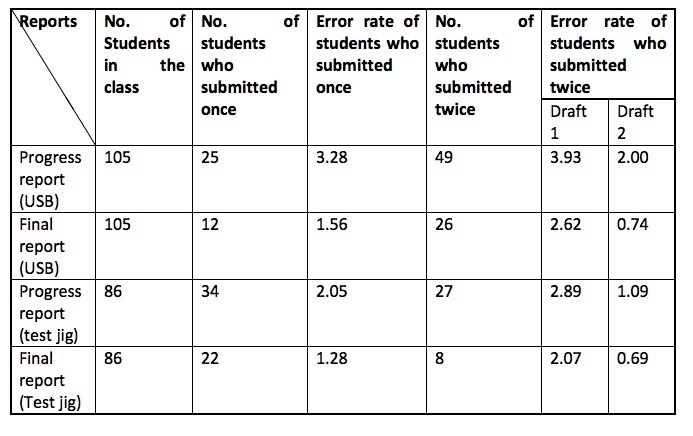 When compared to their peers who had submitted once, the two-submission group had a higher error rate in their first drafts. However the error rate dropped in their revised drafts. For instance, in the first Progress Report, students who submitted once only had 3.28 language errors out of 100 words. Those who submitted twice had 3.93 errors in 100 words. This group of students took the language advice, submitted another draft, and made on average 2 errors in 100 words in their second draft. This drop is to be expected as students could refer to the language teachers’ feedback to improve their written work. However the drop also illustrates the autonomy demonstrated by this group of students in having assessed their own needs and realised that they need more help. They decided to use the on-line advice to cater for their own needs before they sent in their final drafts to the subject teacher. The provision of self-access opportunities can be seen as effective in helping students with their writing when the error rates in writing the same kind of report the first and second time were compared. The two-submission group made fewer mistakes in both drafts 1 and 2 when they wrote the report the second time. For instance, the error rate in drafts 1 in writing Progress Reports dropped from 3.93 to 2.89 in drafts 1, and from 2 to 1.09 in drafts 2 from the first to the second time. Similar findings emerged from the two drafts of the Final Reports. There was a time lag of about 3 months between writing the same reports in the two semesters. It is likely that students retained what they had learned from the many opportunities, such as the workshops and the tutor’s feedback, offered to them at different stages of writing the first report in the previous semester, and wrote better in the next semester. This study aimed to look into how students can benefit from opportunities provided for them to take charge of their own studies in technical writing at different stages of writing. It is a pilot project for embedding self-access language learning opportunities into the syllabus of an academic programme. Due to the limitation in resources, data were not collected from all the participating departments and there was no control group in the study design. Nevertheless, results showed that students were ready to take responsibility for their studies. They showed awareness of their learning needs, chose learning methods and materials, and revised their learning activities according to their own needs. Results also showed that students who took more of these opportunities by submitting the second drafts made greater improvement in their writing. This evidence of success in a WAC programme suggests that learner autonomy can be fostered in subjects other than language courses to maximize the power of self-directed improvement and learning opportunities in nurturing a community of autonomous learners. Littlewood (1997) suggests that autonomous learners are active and self-directed and that they apply these characteristics not only to language, but also in other learning activities, both in and out of the classroom. 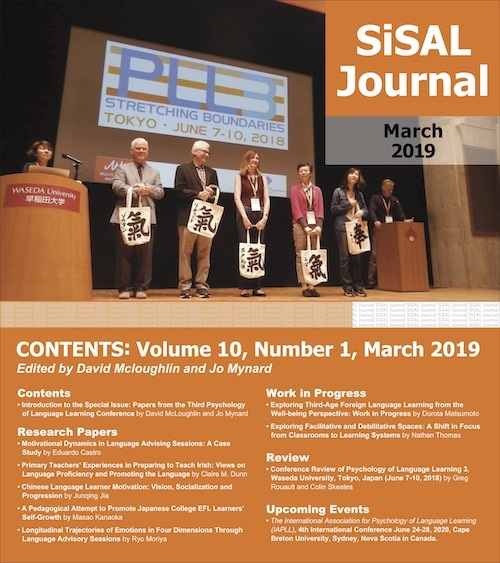 It is these self-initiated, self-responsible, self-monitored, and self-evaluating strategies that can carry learner autonomy across the boundaries of academic disciplines and represent the greatest strength of autonomous learning. Hebe Wong has been teaching degree and sub-degree English enhancement courses for more than 18 years. She has been co-ordinating writing-across-the curriculum programmes for more than 10 academic programmes since 2007. Her research interests include reading strategies, peer feedback on writing and ESP. Benson, P. & Voller, P. (1997). Autonomy and independence in language learning. In Phil Benson & Peter Voller (Eds. ), Autonomy & independence in language learning (pp.1-12). London: Longman. Biggs, J., & Tang, C. (2007). Teaching for quality learning at university: What the student does (3rd ed). Maidenhead : McGraw-Hill. Bruffee, K. A. (2008). Peer Tutoring and the “Conversation of mankind”. In R.W. Barnett & J.S. Blumner (Eds. ), The Longman guide to writing center theory and practice (pp. 206-218). NY: Pearson Education, Inc.
Ferris, D. R (2998). Feedback: Issues and options. In P. Friedrich (Ed. ), Teaching academic writing (pp. 93- 124). New York: Continuum International Publishing Group. Harvey, V. S., & Chickie-Wolfe, L. (2007). Fostering independent learning: Practical strategies to promote student success. New York: The Gulfford Press. Johns, A. M. (1995). Teaching classroom and authentic genres: Initiating students into academic cultures and discourses. In D. Belcher & G. Braine (Eds. ), Academic writing in a second language: Essays on research and pedagogy (pp. 277-293). Norwood NJ: Ablex Publishing Corporation. Littlewood, W. (1997). Self-access: why do we want it and what can it do? In P. Benson & P. Voller (Eds. ), Autonomy & independence in Language Learning (pp. 79- 92). London: Longman. Little, D. (1999). Learner autonomy is more than a western cultural construct. In S. Cotterall & D. Crabbe (Eds. ), Learner autonomy in language learning: Defining the field and effecting change (pp. 11-18). Frankfurt am Main: Peter Lang. Mohan, B. A. (1986). Language and content. Reading, MA: Addison-Wesley Publishing Co.
Shapiro, A. (1991). WAC and engineering, or why engineers can’t write. Paper presented at the Annual Meeting of the Conference on College Composition and Communication (Boston MA, March 21-23, 1991). Thaiss, C. (1998). The Harcourt Brace guide to writing across the curriculum. Florida: Harcourt Brace & Co.